Demand for multifamily rental housing in the United States was higher than expected in 2015, absorbing much of the newly completed supply, according to government research. 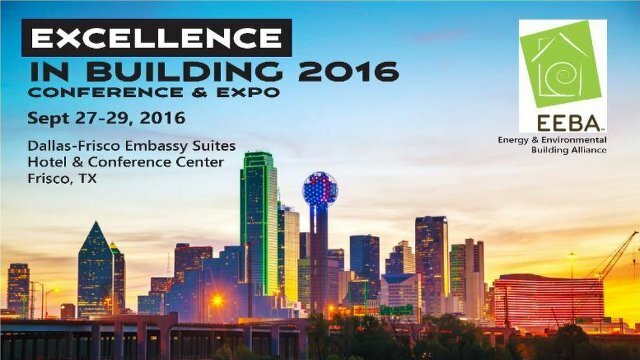 With interest in those structures anticipated to remain strong throughout the remainder of 2016, making multifamily buildings as energy efficient and sustainable as possible will be a focal point of the upcoming Energy & Environmental Building Alliance Conference and Expo. Industry experts, developers and builders will head to Dallas in September to talk strategy and design and to showcase some of the latest advances in the high-performance market. Susan Buchan, EEBA’s executive director, spoke with Proud Green Building and Proud Green Home about the annual event – set for Sept. 27-29 – how energy efficient and sustainable building has changed the program in recent years and how its educational sessions can positively impact future high-performance projects. Proud Green Building/Proud Green Home: The focus of EEBA is on the residential sector. What does the organization do for those involved specifically in multifamily construction, and what impact is EEBA having on that field? Susan Buchan: EEBA has a multifamily track this year and integrates multifamily building science issues into all of our educational sessions. Multifamily housing is the fastest growing sector of the residential construction industry, and many builders turned to constructing multifamily units during the last housing downturn. EEBA is committed to educating builders and designers on all forms of residential housing, and attendees at our annual conference and our educational sessions held throughout the U.S. will find lots of valuable information at both venues. PGB/PGH: Are there lessons about sustainable and green building practices that can be gained by those in all building sectors, including commercial, that are taught in the various EEBA education sessions and events? SB: There is an interesting overlap in the construction techniques and systems in small commercial buildings, multifamily buildings and large residential homes. The building science we focus on has significant implications for many commercial projects, and there is much that can be gained from understanding similarities. Most builders and designers find themselves with a variety of projects in the current market, and EEBA’s educational offerings span these project issues. Knowing how to approach high-performance building in all its forms is critical from a sustainability and resource efficiency standpoint. PGB/PGH: The annual EEBA Conference and Expo will be held in September. How significant is that event to the building industry? SB: We are the only national conference I know of that focuses so completely on building science for building shells, systems and energy and water efficiency. Many conferences relate to points in building standards, or on a specific climate or region. EEBA has maintained its mission of providing a framework of information that allows for smart choices for each climate and keeping our main focus away from specific standards or point programs, and instead relaying information empowers attendees. Those programs have value, but they will come naturally once there is a foundation understanding of how buildings work as a system. You wouldn’t design a good, safe, efficient car without knowing the principles of propulsion, fuel economy or torque. It’s much the same with building houses, but the principles are related to heat flow, moisture management and indoor air quality, to name a few. With these tools, the building is the most durable, efficient and comfortable structure possible. PGB/PGH: How has the evolution of high-performance building changed the focus of the event in recent years? SB: There’s been a lot of progress in understanding the implications of thermal bridging and heat flow in recent years, and as the envelope of the building has evolved, the need for ventilation has been at the forefront of many advances in high-performance homes. At the same time there has been a dramatic increase in the efficiency of HVAC systems through the introduction of ductless mini-split systems and a concurrent decrease in the cost of solar. These factors have converged to create opportunities for zero energy homes at low or no additional cost that were unthinkable even five years ago. Builders and designers are faced with the need to gain an understanding of these factors quickly, and transforming their building practices to meet the market demand for greener homes. PGB/PGH: What are some of the key things those in attendance can learn this year? SB: We have tracks on water efficiency, multifamily homes, energy codes, high-performance building assemblies and indoor air quality that represent the best examples in the market today. The Department of Energy also presents research and outcomes of the Building America program and the Zero Energy Homes programs at our conference each year. That said, perhaps the greatest learning experiences are the networking and collaboration we encourage for attendees with the very best minds in building science. PGB/PGH: One of the key lectures at this year’s conference will be on building science, which has become a vital focus in all sorts of building construction. What lessons are there to be learned there? SB: Building science is the foundation of everything else I’ve mentioned. The trick is tying those principles to actual cases in the field so that sessions are relevant to those in attendance, and interesting – no one wants to relive Physics 101. That’s the thing EEBA has always done best – building science directly related to real world issues for designers and builders. I think this year’s lectures will all be exciting and stimulating to anyone involved in high-performance homes and will result in real change in the way our attendees view their work and build their projects. PGB/PGH: People can sign up now for the conference and expo. How does the anticipated attendance compare to other years? What do those numbers say for what’s offered to participants and the significance of energy efficient and environmental building? SB: Last year, we had a great crowd – 500 attendees from all over the U.S. and Canada. I hope and expect this year to top that number. We have never strived to become a huge conference. There are conferences that have thousands of attendees, and most EEBA folks would rather have time to immerse themselves in sessions and conversations that simply aren’t possible in what I call the “New York subway at rush hour” events. Ours is a different experience, and we get feedback each year that the EEBA Conference is especially valuable to our supporters because of the quality and depth of the presentations, not the sheer number of people there. Of course, I’d like us to increase our numbers as the market grows, but maintaining the value and quality of our event is our main focus.